European eel Anguilla anguilla, photographed by Ron Offermans. The eels are, without a doubt, one of the more distinctive groups of bony fishes, with their elongate snake-like bodies and linearised fins. 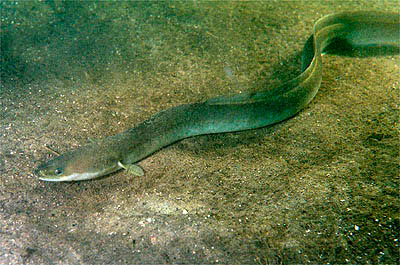 And among the eels, perhaps the most familiar to many people are the freshwater eels of the genus Anguilla. 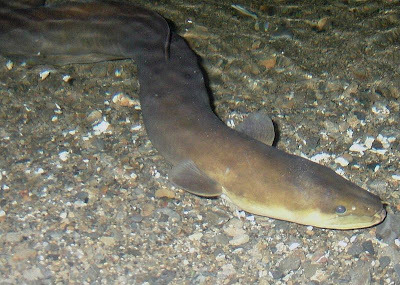 Being able to wriggle across land on damp nights, eels can be found in a wide variety of water bodies, even small and isolated ones (such as cattle troughs). But the very familiarity of the freshwater eels disguises what are, in some ways, very poorly known animals. First off, though, I have to provide something of a correction. Way back in 2007, in one of my earliest posts at this site, I made the comment that the deep sea gulper eels were 'not real eels', on the basis that they were placed in a separate order Saccopharyngiformes from the true eels of the Anguilliformes (referred to in many older texts as the Apodes, the 'legless ones'—which is a bit of a funny feature to be focusing on when talking about a fish). Witness the misleading nature of non-phylogenetic classifications! For, as turns out, phylogenetic studies have demonstrated that gulpers are indeed 'real eels', with Saccopharyngiformes well-nested among the Anguilliformes (Inoue et al. 2010). Their previous separation was due not to phylogenetic distinctiveness, but just to their individual wierdness. New Zealand long-finned eel Anguilla dieffenbachii, photographed by Gusmonkeyboy. This species is known to grow surprisingly large: the largest on record being about 24 kg (so sayeth Wikipedia). It is generally believed that such giants are females that have, for some reason, failed to develop to reproductive maturity and instead remain as juveniles. Anywho, back to Anguilla. This genus includes some fifteen species, most of which are found around the Pacific, with four species around the Indian Ocean and two around the North Atlantic (Lecomte-Finiger 2003). Contrary to one of the opening statements in the just-quoted review, Anguilla species are not the only freshwater eels: the Indo-Pacific moray Gymnothorax polyuranodon also enters fresh water* (Ebner et al. 2011). All freshwater eels also return to the sea to breed; this is referred to as a catadromous life-cycle (as opposed to an anadromous life-cycle as found in salmon, where the fish spend part of their lives in the sea and return to fresh water to breed**). It wasn't until the 1990s that it was discovered that some Anguilla eels spend their entire lives in the sea, and never enter fresh water (Tsukamoto et al. 1998). 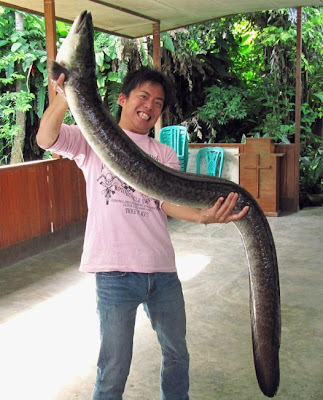 *Just to confuse matters, there are also the pantropical freshwater swamp eels and spiny eels. Despite the name (and despite their superficial appearance), these are members of the percomorph radiation. **I mention this because personally I can never remember which is which. Marbled eel Anguilla marmorata, in the evidently excited hands of Seishi Hagihara (the eel, presumably, was somewhat less impressed). This is the only species to be found in both the Indian and Pacific Oceans. Where the eels go once they return to the sea was long an unknown, and it wasn't until the Danish biologist Johannes Schmidt traced the leptocephalus larvae of the European eel Anguilla anguilla across the Atlantic in the early 1920s that it was realised that they travel all the way across the Atlantic to the Sargasso Sea, close to North America. Even now the breeding locations are known for only three of the fifteen Anguilla species: the European eel Anguilla anguilla and the American eel A. rostrata both breed in the Sargasso Sea, and the Japanese eel A. japonica breeds in the Marianas Trench. Molecular dating suggests that the two Sargasso species diverged between 3.8 and 1.9 million years ago, and it has still not been established how the species became distinct. Certainly such a date would be far too recent for the once-popular suggestion that they might be the descendants of an ancestral population divided by the widening of the Atlantic. There is also evidence of a hybrid zone between the two species: eels collected from Iceland, though predominantly belonging to the European species, have been shown to have 2-4% derivation from the American species. Polynesian long-finned eel Anguilla megastoma, from Bernhard Höller. 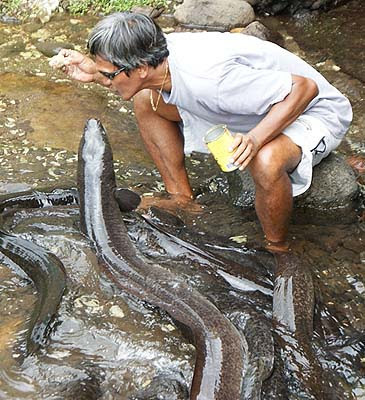 The eel in the photo is estimated to be about 12 kg in weight. Both this species and A. marmorata are found in French Polynesia: A. marmorata is found in downstream, low-gradient parts of rivers while A. megastoma is found in upstream, higher-gradient stretches. A third species in the region, A. obscura, prefers still estuaries (Lecomte-Finiger 2003). All fifteen Anguilla species were included in the phylogenetic analysis of Anguilliformes by Inoue et al. (2010). This analysis supported a relationship of Anguilla with a clade of mesopelagic eels containing the Serrivomeridae (sawtooth eels) and Nemichthyidae (snipe eels). Sister to all of these were our old friends the gulpers. The (admittedly limited) available evidence about the habits of Anguilla during the marine phase of their life suggests that these three lineages may form a single ancestrally pelagic clade, contrasting with the near-bottom habits of most other eels (members of the Derichthyidae, the longneck eels, represent an independent origin of pelagism). Ebner, B. C., B. Kroll, P. Godfrey, P. A. Thuesen, T. Vallance, B. Pusey, G. R. Allen, T. S. Rayner & C. N. Perna. 2011. Is the elusive Gymnothorax polyuranodon really a freshwater moray? Journal of Fish Biology 79 (1): 70-79. Inoue, J. G., M. Miya. M. J. Miller, T. Sado, R. Hanel, K. Hatooka, J. Aoyama, Y. Minegishi, M. Nishida & K. Tsukamoto. 2010. Deep-ocean origin of the freshwater eels. Biology Letters 6: 363-366. Lecomte-Finiger, R. 2003. The genus Anguilla Schrank, 1798: current state of knowledge and questions. Reviews in Fish Biology and Fisheries 13: 265-279. Tsukamoto, K., I. Nakai & W.-V. Tesch. 1998. 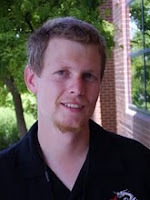 Do all freshwater eels migrate? Nature 396: 635-636. 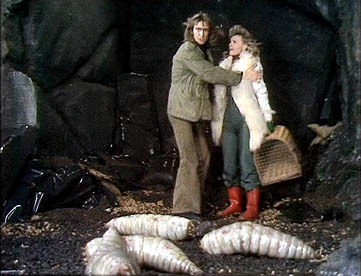 Re catadromous vs anadromous, maybe a mnemonic could go like this: the words mean respectively down-running and up-running, so they run towards the breeding grounds. Travel in the opposite direction has a less enticing goal so is more sedate. catadromous = migrating down to the sea to breed. anadromous = migrating up rivers to breed.